Visitors have flocked to Rome, the 'Eternal City', since the Middle Ages, when pilgrims journeyed to the centre of Catholicism. More recent travellers have been captivated by the city's ancient sites, its rich heritage as headquarters of the Roman Empire, and the legacy of the great Renaissance artists. And the typically sunny weather doesn't hurt. For a major capital city, there are surprisingly few purpose-built hotels, but there is plenty of accommodation to suit all tastes. Most of the best places to stay in Rome are housed in old buildings: mansions, palazzi, and villas. Take your pick, whether that's one of our recommended hotels or an apartment suggested by our online partner, booking.com. If you want to be close to the Colosseum and the Imperial heart of Rome, then the Celio is one of the best places to stay in Rome. The area is arranged around the Caelian hill, which has a beautiful park, and is surprisingly residential in feel while also having some fascinating early churches and some great bars and restaurants. Consider staying in one of our Guru recommended 3 Best Hotels in Celio. As a visitor the Spanish Steps are another great place to be based - centrally located, gloriously Roman and packed with charming designer and boutique hotels. 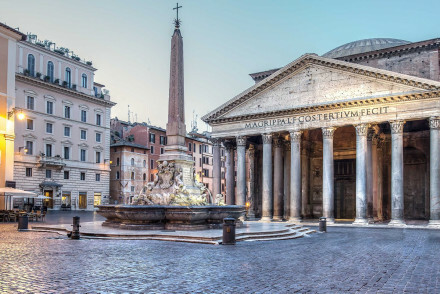 Or you might prefer to be based close to the Pantheon and the Piazza Navona? This area of grand piazzas, baroque fountains and atmospheric churches is rich with cultural icons and good bars, shops and restaurants. These are, in our opinon, the 10 Best Hotels near the Pantheon. If you stay around the Campo de' Fiori and the Piazza Farnese you’ll be close to the fantastic morning markets and some charming artists' workshops and galleries. We've picked the 4 Best Hotels in Campo and Farnese to recommend to you. If you’re looking for Rome at its hippest the Monti district is for you. This narrow warren of streets and alleyways is rife with great places to eat and drink. We recommend the 10 Best Hotels in Monti. The gentrification hasn’t quite reached the Stazione Termini area, and this is the place to find budget options. You could also consider Testaccio, which is fairly sedate during the day but very lively come the evening. We can recommend the Best Hotels in Testaccio, Rome too. If you’re looking for a peaceful place to stay consider Trastevere on the Tiber’s right bank, a place well visited for its picturesque alleys and ancient churches, but not quite so many people stay. 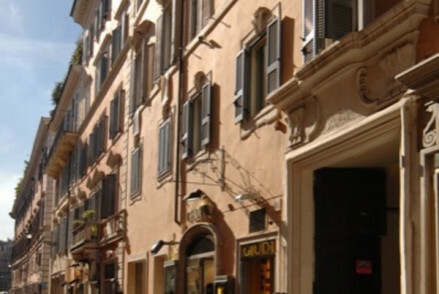 If you do start your hotel shearch with our recommendations for the 4 Best Hotels in Trastevere. Or you might consider the Aventine Hill, residential, yet still close to Rome’s main sights. 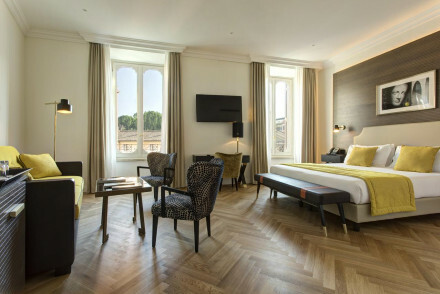 We've picked the 3 Best Hotels near the Aventine Hill to start you off. If it's your first visit to Rome then you'll be kept busy with the headline sights. Rome isn't just the capital of Italy and the historic heart of the Roman Empire; it's also home of the Vatican. So, as well as the art, architecture and ruins, Rome bursts with religious art, relics and architecture - not least of all St. Peter's and the Vatican. Architecturally, the Pantheon is one of the world's best-preserved ancient monuments - it's around 2000 years old - an amazing, and very beautiful, feat of engineering. And the Roman Forum was a showpiece for the age. Rome has long been the hub of the art world as well, there are pristine classical statues, incredible Renaissance frescoes, graceful fountains by the best sculptors of the day, and all of it is out on the streets. One of the most celebrated of Rome's exquisite piazzas is the Piazza Navona, which has everything - Baroque architecture, three ornate fountains, wonderful cafes and restaurants and plenty of street artists and hawkers - this spot used to be Rome's main market! 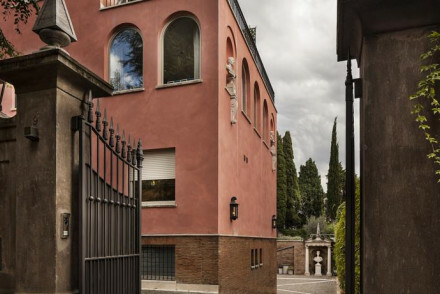 Then there's the museums, both art and historic, including the Vatican Museums and the Museo e Galleria Borghese, home to two of the world's most incredible art collections. Not to mention the Capitoline Museums, dating from 1471, home to some of the world's best-known works of sculpture. If you're getting the sense of the words 'world's best' and 'world's greatest' being overused here, rest assured, it's not unwarranted. And of course you need to make sure you throw your three coins into the glorious Trevi fountain and wish to return... If you threw your three coins in the fountain and you're back, take some time to let Rome infuse into your system. Book a room in one of our recommended hotels, spend longer over piazza cafe stops and make sure you eat and drink well! You might also want to make time to explore some of the old roads in and out of Rome, or see some of the less well-known museums and galleries - and there's a long list to choose from! The Catholic Church is behind some of Europe's richest architecture, art and history so a trip to the Vatican City is an absolute must. Religious or not, the sights are bound to leave you absolutely awestruck. Plus, it's by far the most interesting and unique of the world's only three remaining city-states! The breathtaking St Peter's Basilica is one of Rome's most stunning sights, probably the most renowned piece of Renaissance architectur. Liturgies performed here by the Pope are attended by up to 15,000 people (so it's probably best to plan around that!). An absolutely wondrous sight. Stroll through the lovely Villa Borghese gardens on your way to the Museo e Galleria Borghese. Littered with sights and landscape features like the 18th century Temple of Aesculapius, a walk through the park can provide some much needed relief from the tourist-strewn streets. Bring along a picnic and make a day of it! The city is a very busy year round destination, so if you want to ensure a room in one of the best places to stay in Rome, make sure you do your homework and book well ahead! Capo d'Africa is a sleek, contemporary hotel with a gorgeous roof terrace directly overlooking the Colosseum. Not only are you right in the heart of things, you're staying somewhere with retro style-as well as an excellent gym, restaurant and bar. The ideal urban retreat. Or you might try the Hotel Celio. 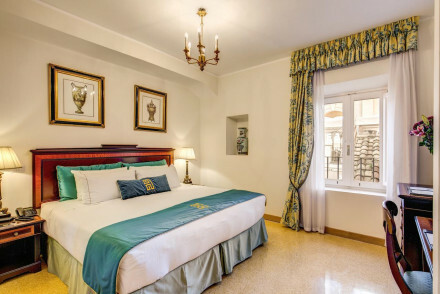 It is directly opposite the Colosseum and has 19 exquisite rooms, with features like mosaic floors, frescoes, trompe-l'œil paintings and all the mod, cons.. Right beside the Spanish Steps, Crossing Condotti has just six rooms filled with well chosen Baroque antiques, tasteful art and enormous beds. What's more, there's a wonderful concierge service and bathrooms featuring L'Occitane toiletries! Central, elegant and superbly romantic. 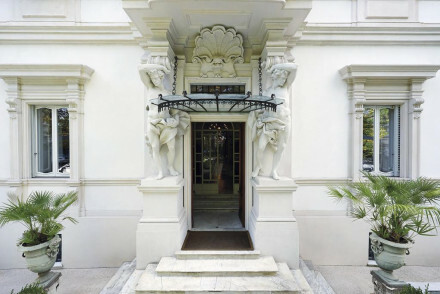 The Piazza di Spagna 9 is a beautifully designed mansion in the heart of Rome with just six, individually decorated rooms, a Turkish steam bath and its own contemporary art gallery. Families will be well catered for in the elegant Albergo del Senato with a wonderful roof terrace bar, a traditional and relaxing atmosphere. G-Rough is one of the hippest spots in Rome. Its ten rooms have been converted from from a 17th century townhouse, and the parquet floors and original tiles have been retained, but they’ve added retro design furniture and exposed stone walls and the effect is chic yet modern. There’s a fantastic roof terrace and a buzzy bar. 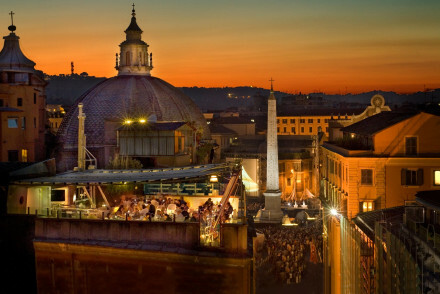 The Hotel Campo de 'Fiori has a fantastic roof terrace overlooking the city skyline. You'll find romantic bedrooms with four poster beds, regally painted walls and frescoed ceilings, in a great location close to the morning markets. 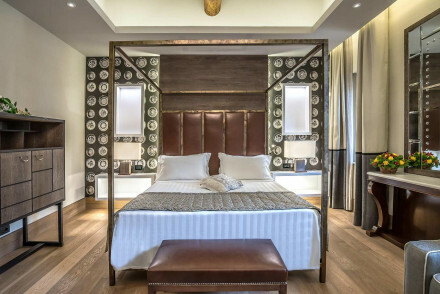 An elegant, townhouse style hotel with 15 stylish rooms and an unpretentious feel, The Fifteen Keys Hotel is perfectly located in bohemian Monti. close to great antique boutiques and great cafes. They serve breakfasts alfresco in a charming garden courtyard. 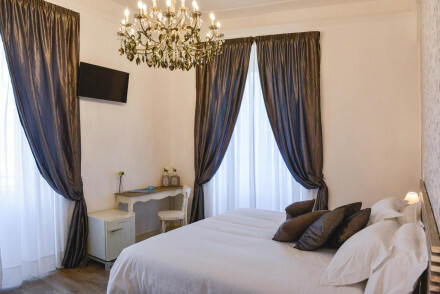 The Hotel de Monti is a bright, modern B&B with seven comfortable rooms well located between the main train station and the Colosseum, with a room rate which starts from as little as €66 per night. The Althea Inn is a secluded, penthouse B&b with three spacious, white-washed rooms with simple decor. The real pleasures are the private, flower-filed balconies - perfect for enjoying an apertivo while the sun goes down over spectacular Rome. Rooms start from only €70 per night. 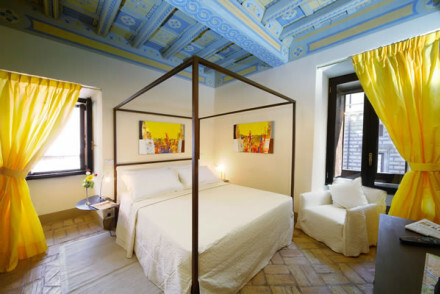 The Santa Maria di Trastevere is a converted convent in a wonderful location. Arranged around a fragrant central courtyard, the 18 simple, yet generously sized rooms are comfortable, there’s a complimentary continental breakfast and beautiful features like cloisters and modern frescoes. Plus they provide complimentary pre dinner snacks every evening between 5 and 8 pm, and a number of bikes are available for guests to use. Buonanotte Garibaldi is a chic little B&B with just three rooms and a lovely breakfast courtyard. The decor is different each room but there are lovely oak floors, antiques and silk paintings. San Anselmo's Baroque flamboyance and lavish drapery will transport you back in time to another era. Situated in the smart Aventine district, enjoy breakfasts in the beautifully tendered garden to set you up wonderfully for the day. The Hotel Villa San Pio is an elegant, 78 room hotel with Baroque-inspired interiors, impressive gardens and indulgent breakfasts. Expect rich fabrics and a regal air. 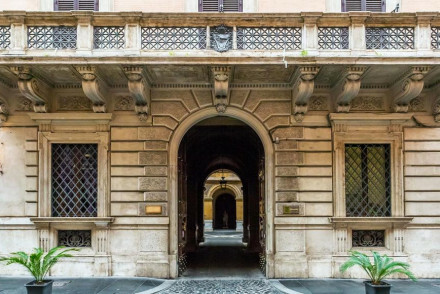 Five minutes from the Trevi Fountain, the Villa Spalletti Trivelli is a noble Roman townhouse renovated to perfection. The 12 rooms are classical, tranquil and aristocratic, and what's more you're in a beautiful neighbourhood surrounded by lush gardens. Five star luxury at the Eden provides the ultimate upmarket city experience. With opulent interiors and elegant suites, you'll truly feel like a VIP-and the hotel has a long history of accommodating celebrity guests! A stunning spot, ideal for couples retreats. Suite Sistina's ten rooms are perfect for honeymooners with their oversized glass sided showers, luxurious bathtubs and giant round beds. You're also staying in a beautiful building just metres from the Spanish Steps. Located on the Via Veneto, Hotel Regina is dripping with Art Deco opulence. 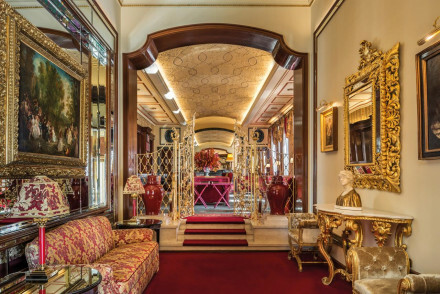 One of Rome's original grand dame hotels, this extravaganza promises to be a truly memorable stay with luxurious accommodation and all the other necessary amenities such as a restaurant and gym. 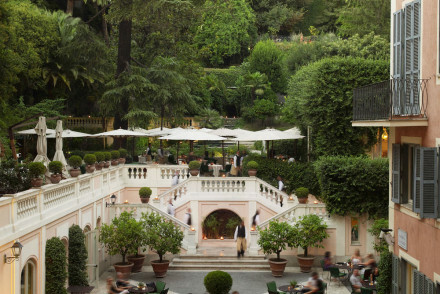 The Hotel de Russie, part of Rocco Forte's empire, features a glorious garden complete with lemon trees and statues. This adult city-stay enjoys a great location and offers modern accommodation, as well as an excellent restaurant and extensive spa facilities. Residenze Torre Colonna is a fantastically chic boutique guesthouse with a rooftop terrace offering spectacular views over Rome. 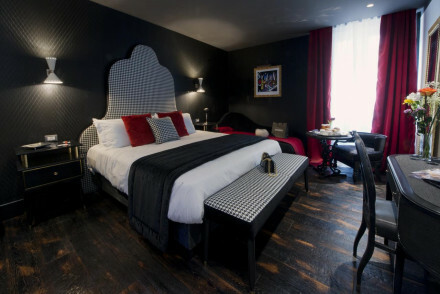 There are just five rooms, all of them romantic, with four poster beds, white washed walls and splashes of modern art. 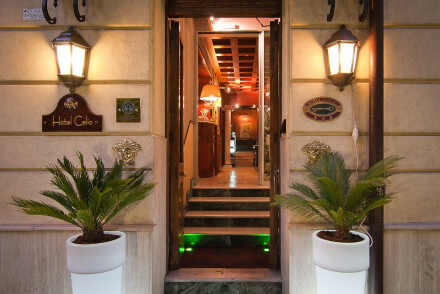 Teatro di Pompeo is a simple and friendly B&B on the historic site of Pompey's Theatre. Offers unfussy but charming accomodation and it's located right in the thick of things. A superb spot from which to get to know the city. Casa Montani is a classy, five room B&B opposite the Piazza del Popolo, just a short walk from most of the headline attractions. Modern and neutral interiors with very personalised service. An upmarket stay without breaking the bank! 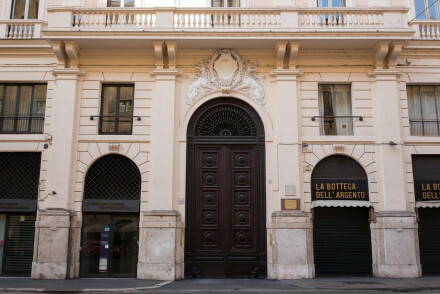 Albergo del senato offers elegant rooms and suites within a short stroll of the Pantheon. 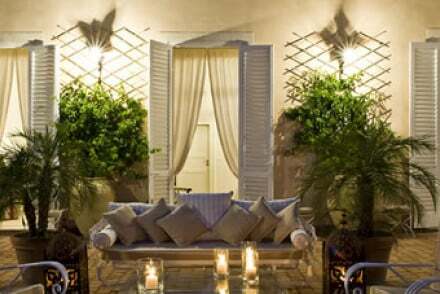 There's a fabulous roof terrace and a traditional relaxed vibe throughout, despite the beautiful decor. 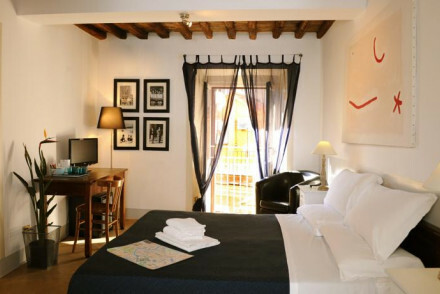 The Locanda Cairoli is a comfortable, 15 room hotel close to the Piazza Navona. The gardens are beautiful and there's a feeling of sharing a private home rather than staying in a hotel. The Blue Hostel is a classy spot far more reminiscient of a hotel than a hostel. No restaurant, but it provides stylish accommodation bang smack in the centre of town-what could be better? Family rooms are also available. 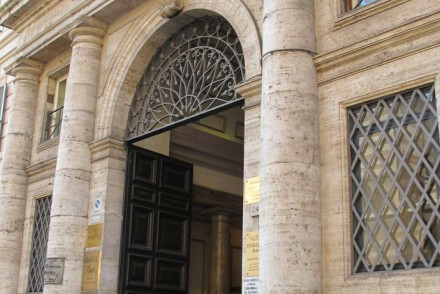 Due Torri is located in Rome's historical centre, set in a building that has previously housed members of the clergy and noble families. Stay in charming accommodation featuring antique furniture and attentive, friendly staff. 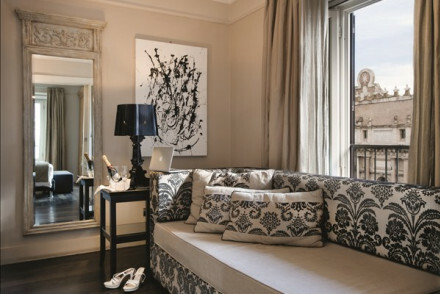 Boutique, sleek, stylish and centrally located-Spagna Royal Suite has it all. Located less than a mile from most of the sights, this is a superb option for a romantic city stay. 1880 Atypical Rooms certainly suits its name. Smart accommodation in a top spot featuring exposed brick walls, scandi style furniture and rain showers. 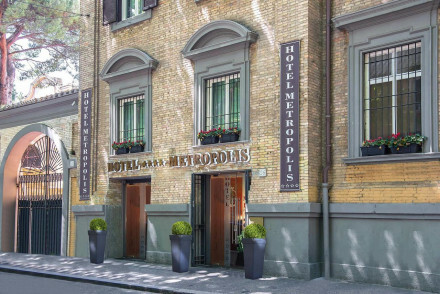 Attractive and romantic, the Hotel Modigliani is ideally located between the Trevi Fountain and the Spanish Steps. They offer family suites and apartments as well as rooms, all with elegant decor and modern art, and some with private terraces. Rooms start from €90 per night. Low key 1920s glamour with a lively bar are on offer at the Locarno. It's one of the best places to stay in Rome for a weekend away if you're on a budget. For great value in a party location the Santa Maria di Trastevere offers spacious simple rooms and a courtyard for outdoor eating. Plus they provide complimentary pre dinner snacks every evening between 5 and 8 pm, and a number of bikes are available for guests to use. For a wide range of apartments from great value studios to designer penthouses, check out the selection at booking.com, our online partner. In terms of the weather, the best time of the year to visit Rome is definitely during the summer months, when the average high is around 26 degrees celcius. That said, from October to April the tourist crowds disappear and room rates are lower... So it's really up to you! Rome's Leonardo da Vinci Airport in Fiumicino (a half hour train ride away) is used by all major airlines, but there's also Ciampino Airport. Check out places to stay in the region of Lazio? Secluded penthouse B&B off the beaten track with spacious rooms, whitewashed walls, simple décor and the piece de resistance, a flower-filled private balcony on which to relax and enjoy an aperitivo as the sun goes down. A great budget choice and for those wanting to sample out-of-the-way Rome. 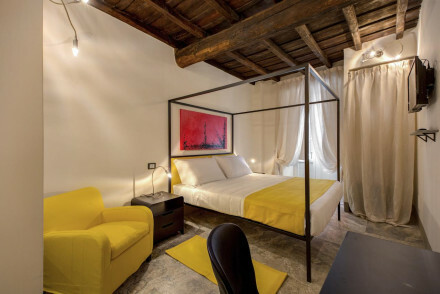 Cheap, contemporary chic B&B steps from the Trevi Fountain. Rooms, suites, family rooms, and one apartment all in creams, bronzes and browns. Lovely breakfast room and bikes to rent. A great choice for those on a smaller budget. 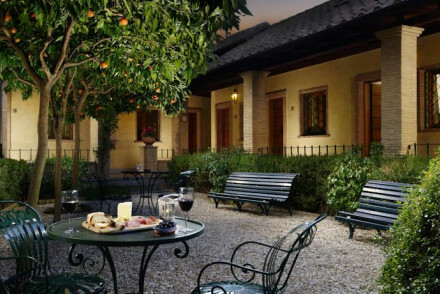 Very attractive hotel with a gorgeous inner courtyard. Elegant bedrooms, suites, family rooms and one apartment with flashes of Florentine fabric, white washed walls, modern art works, and private terraces. Fresh flowers adorn every room. Romantic, family friendly, and very artistic. A classy, upmarket hostel in the centre of Rome. 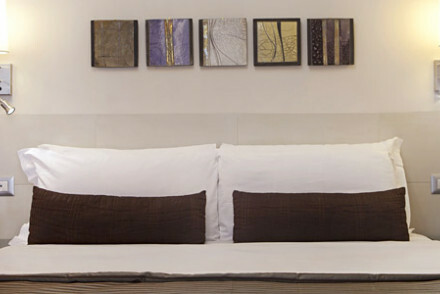 The beautifully appointed rooms are stylish and comfortable, decorated with tasteful furniture and artwork. It's the ideal launchpad for a exploring Italy's capital, within walking distance of many of the city's great attractions. Families - With family rooms available, and a fantastic central location, it's great for a family trip to the Italian capital. Sights nearby - Within a mile of the Coliseum, the Roman Forum and the Trevi Fountain. Great walks - Walk up the Palatine Hill and get incredible panoramic views of Rome. 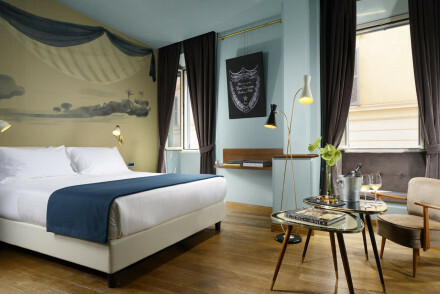 This smart design hotel is located a stone's throw from the Pantheon in Rome. 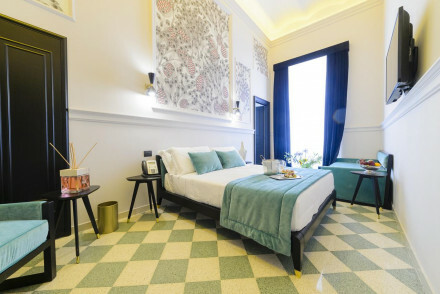 Conceived by two Italian architects, the hotel offers individually styled rooms in pleasing pastel tones with original terracotta floors and unique Italian design pieces. Enjoy the room-served breakfasts; a charming hotel. An elegant B&B close to the Spanish Steps. Rooms, ranging from double room to a suite, feature rich colours and stylish bathrooms. Take in a breakfast in the dining room before heading out to see the city. Hotel will help with tours and sightseeing guides. Good value in great part of Rome. Located in an impressive 19th-century building with a pretty courtyard. A small, well-run, guesthouse with white washed rooms and contemporary bathrooms. Original features throughout with sculptures and domed ceilings. Well positioned in the historic centre within easy reach of Rome's sights. Local exploring - Well located near many of Rome's sights and with great transport links. Sights nearby - Just a 10 minute walk from the Colosseum, Piazza Venezia, the Roman Forum, the Trevi Fountain and the Spanish Steps. 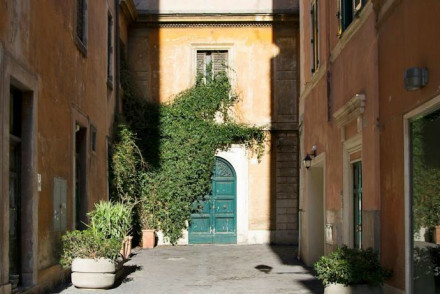 Charming townhouse near the Spanish Steps and Trevi Fountain. 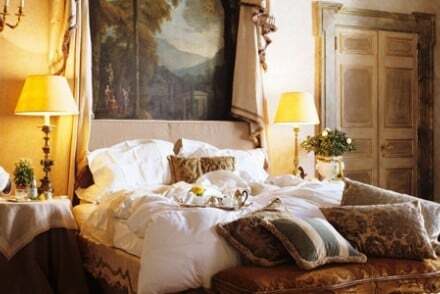 Beautiful bedrooms in neutral tones with stone floors, cast iron beds, fireplaces and wooden beams. Lovely sitting room and friendly service. A great value choice with lots of charm. 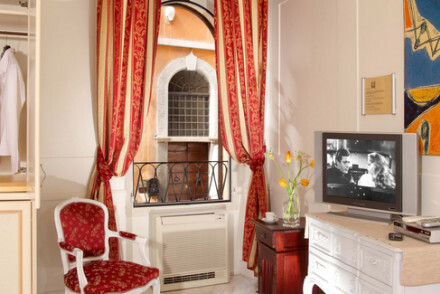 A charming historical hotel just a few steps from Piazza Navona and the Vatican. Surprisingly quiet for its central location, the elegant rooms offer comfortable beds and antique furniture. A true gem with plenty of traditional charm. Local exploring - Location is perfect for those wishing to emerce themsevles in Rome and explore like a local. Historic - Previously the building housed Cardinals, Bishops, and famous noble Roman famillies. Families - Four small apartments are ideal for accommodating families. Great walks - Right in the historic heart of Rome, wander the streets and get a feel for the Eternal City. 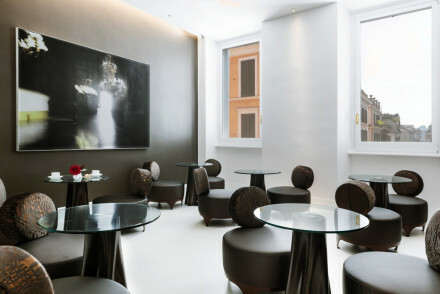 A stylish hotel in the heart of the Piazza de Spagna, in Rome's city centre. Urbane and luxurious rooms with fashionable furnishings and mosaic ensuite bathrooms. The perfect launchpad for a weekend's exploring Rome. 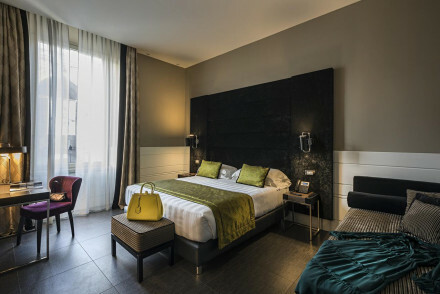 Romantic Break - A luxurious, romantic place to stay in the Italian capital, with sleek and stylish suites, funky modern art and design features. Local exploring - The hotels central location places it within easy reach of Rome's major sights and sounds. Sights nearby - Visit St. Peter's Basilica just over a mile away. This exclusive hotel occupies a pretty townhouse in central Rome. The villa's original features shine through in the modern and simply dressed suites boasting hand-selected design pieces; book the Suite Royal for a Roman-style terrace bath. Enjoy a cocktail in the lounge garden; a luxurious stay. This family-run B&B is located on a heritage site in the Esquilino district of central Rome. 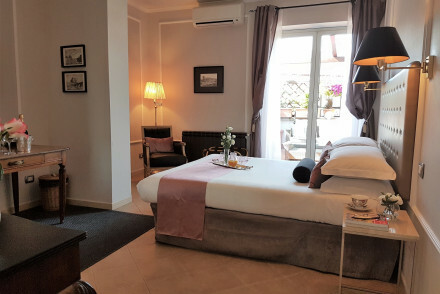 Rooms are individually designed and feature upcycled furniture and vintage style soft furnishings; the best rooms offer French windows opening onto a private balcony. A charming and friendly guesthouse. A chic boutique hotel located in the heart of the city. Individually designed rooms offer styles from classically elegant to more contemporary. All have sash windows, wooden floors and wallpaper by Fornasetti. Breakfast is served on the expansive terrace offering glorious views across Rome. 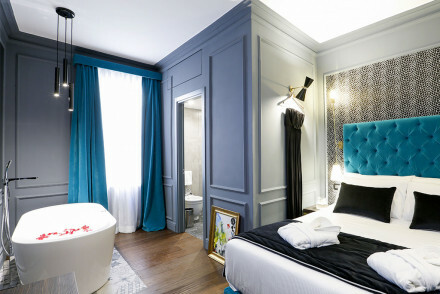 City Style - A chic contemporary hotel set in the trendy district of Monti. Sights nearby - Visit the famed Roman Forum, Colosseum and Pantheon, all within walking distance from the property. 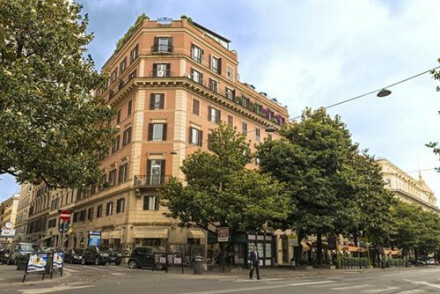 Classic hotel with modern comforts next to Piazza del Popolo and close to the Spanish Steps & Villa Borghese. Three restaurants and a piano bar. 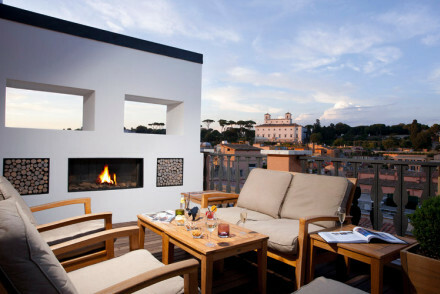 The magnificent roof terrace has wonderful views of Rome. Cool bar and classy restaurant Hi-Res with gourmet cuisine. Great location for a short stay. A chic boutique hotel boasting the most central of locations. Smart rooms are a design masterpiece with dog-tooth check fabrics and minimalist furniture set against dark blue walls. The marble bathrooms are equally luxurious. A short stroll from the city's main attractions, this property has it all. Local exploring - Ideally located just steps from the Colosseum and besides the wall of the Forum of Nerva. Great walks - Enjoy a stroll through the tranquil botanical gardens, Orto Botanico. Sights nearby - Visit the Trevi Fountain, Pantheon, Piazza Navona and Spanish Steps. 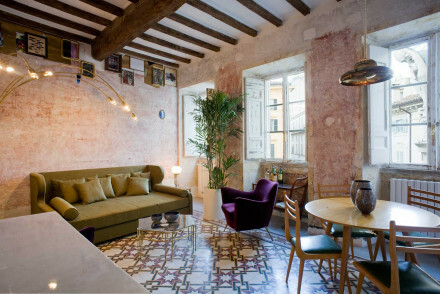 A chic hotel in central Rome. Contemporary and luxurious rooms feature original art works and a muted colour scheme, Mac computers and modern bathrooms. A lively location and a very cool spot for a weekend in Rome. A slick contemporary hotel in an excellent central location. Well proportioned, light, rooms feature exposed stone walls, scandi styled furniture and modern bathrooms with rain showers. Indulgent breakfasts served. Close to many of Rome's most famed sites. An ideal base for exploring the city. Local exploring - Located in the heart of Rome and walking distance from many attractions. Sights nearby - Just a 15 minute walk from the Coliseum, the Campidoglio, Santa Maria Maggiore Basililica and Trevi Fountain. 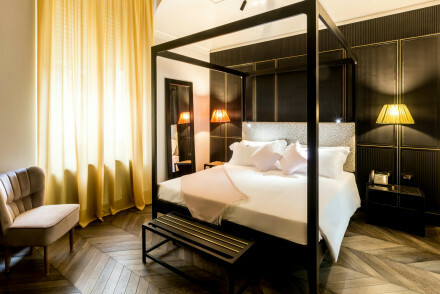 Fashionable boutique hotel designed by the Fendi family. Set in luscious gardens alongside the river Tiber. Attention to detail throughout the rooms and living areas is spectacular - marble pillars, antique fabrics, black and white chequered flooring, 1930s art deco furniture. Tranquil and trendy. 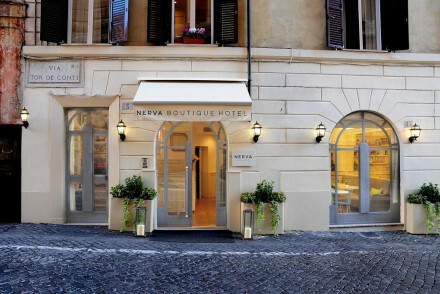 This boutique hotel is located close to Piazza Navona in central Rome. Rooms are bright and airy with hand-selected design pieces; the best suites offer a private terrace and living space. Many of the building's original features have been preserved, including terracotta floors. A smart city stay. 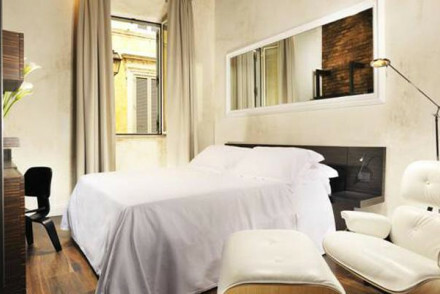 This stylish boutique hotel is located in central Rome, a stone's throw from Piazza Barberini. Rooms boast modern interior design with exclusively Italian soft furnishings, from the hand-made flooring to the brass light fittings; the best suites have a terrace or jacuzzi. An exclusive design hotel. 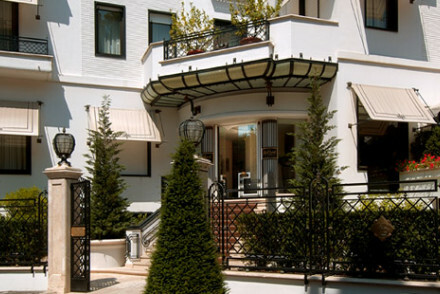 An elegant townhouse hotel with stylish accommodation and an unpretentious feel. Enjoy alfresco breakfasts in the garden courtyard. Located in a charming neighbourhood, the area has a bohemian feel with great antique shops and good coffee spots and is close to major attractions. Local exploring - An ideal location for getting to know Rome from its major attractions to its boutiques, galleries and local eateries. An exclusive villa in the tranquil Parioli district of Rome. Suites are dressed in warm tones with classical interior design; hand-selected antiques and plush linens complete the romantic feel. Relax in the hotel's beautiful Arts Garden after a day out. Escape the crowds at this refined bolt-hole. 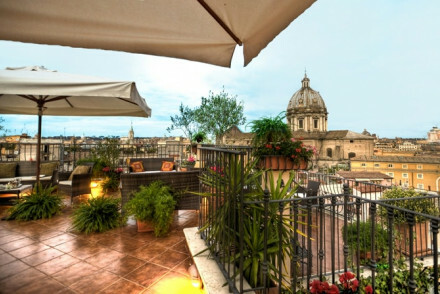 A gorgeous boutique hotel with views over Rome's skyline from a fantastic roof terrace. Romantic bedrooms have canopied fourposter beds, frescoed ceilings, antique furniture and regally painted walls. A great choice for a romantic getaway to Rome. 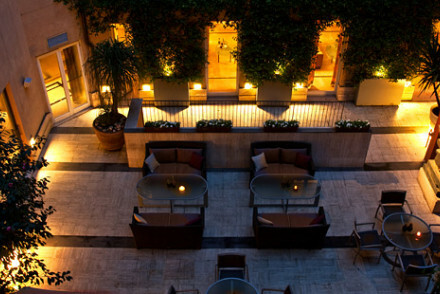 This luxury, five-star hotel is housed in a renovated 18th-century palace in the Roman Forum. Rooms are smart and spacious with hand-selected design pieces; the best suites offer a private jacuzzi and terrace. Relax in the exclusive spa before dining at restaurant Madre. An indulgent getaway. An intimate hotel in the centre of Rome. Unique rooms feature charming wallpapers, antiques and all the mod cons. An authentic breakfast room has family antiques and artworks on the walls, and the parlour room is perfect to relax in after sightseeing. A boutique spot. 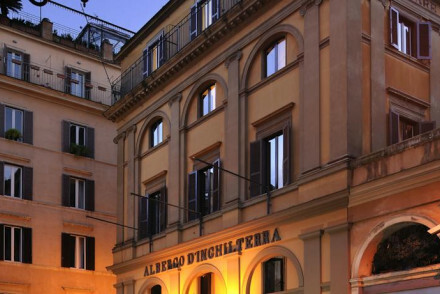 This pretty boutique hotel takes its name from the renowned archaeological site it faces in central Rome. Rooms are dressed with luxurious soft furnishings in soft pastels; book the Junior Suite to enjoy a private jacuzzi. Relax with a drink at the sleek hotel bar in this exclusive Roman guesthouse. 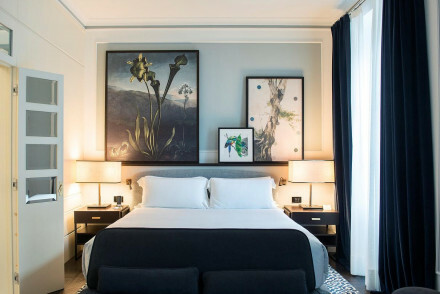 Stylish 4-star hotel in the historic centre of Rome and just a stone's throw from the Vatican, offering a restaurant and upscale designer rooms in greys and whites adorned with modern artworks. A perfect starting point for exploring the Eternal City, from renowned shopping streets to museums. Local exploring - A very central location perfect for exploring the Vatican, the shopping promenades, museums and sights of Rome. Sights nearby - A short walk away from the Vatican and the Basilica of Saint Peter. 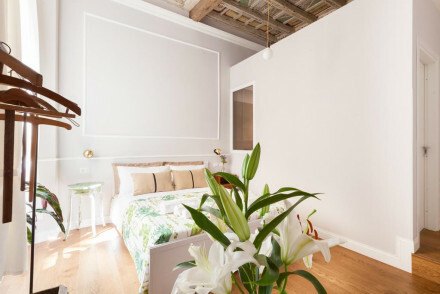 Redefine the romantic Rome getaway at this chic and intimate B&B. Airy hotel interiors overflow with plants and lead to minimal yet warm rooms, complete with vast bathrooms and wood accents. Enjoy breakfast before heading out to take in Rome's offerings. A welcome, modern twist on a classic weekend. 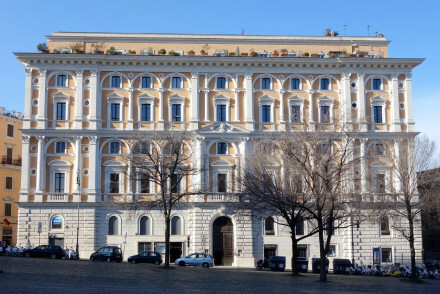 This luxury hotel sits in the centre of Rome overlooking Piazza Barberini and the Triton Fountain. As the name suggests, the hotel is an ode to Baroque style; expect marble bathrooms, dramatic draped curtains and stone reliefs. Book the stylish suite for a private terrace and sauna. An elegant stay. An elegant hotel tucked away in enviably quiet gardens. 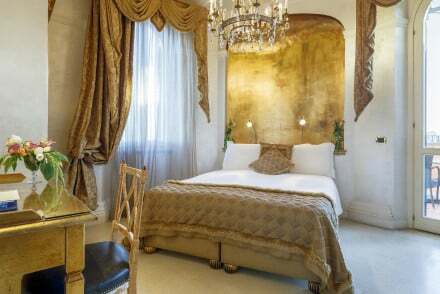 Baroque inspired interiors give a regal air to the rooms, complete with decadent headboards and rich fabrics. Indulgent breakfasts are a great start to a days exploring. Well located within easy reach of many of the main attractions. Hideaway - An elegant property in a leafy garden that exudes an exclusive secret air, yet is within walking distance of the sights. Sights nearby - Rome offers eternal sights many of which are located near the hotel. Be sure not to miss the Coliseum and Trevi Fountain. An Art Nouveau property in an excellent hilltop location away from the mass of sightseers and with excellent views. 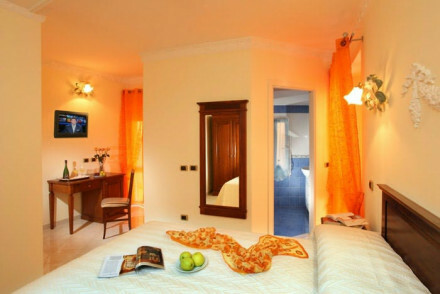 Rooms and suites with private terraces, wallpapered walls, marble bathrooms and huge comfy beds. A great choice for an understated stop over. Contemporary boutique hotel with a fantastic roof terrace restaurant. Plush bedrooms and suites have parquet floors, huge comfy beds and all the modern gadgetry. Magnificent views from private terraces and the roof top. Romantic and stylish enough for the modern traveller. Classy five-bedroom B&B opposite the Piazza del Popolo. Neutral tones, with designer fabrics, hardwood floors and chic modern artworks, plus the bonus of a personalised service from the owner. A des res with all mod cons, it offers luxury in an intimate, affordable city centre setting. This contemporary hotel is located in the historic centre of Rome. Rooms have a decadent touch, with satin-style throws and textured headboards; the marble bathrooms add a further sense of indulgence. Suites offer ample living space for families. Relax in the chic Lounge Bar; a smart city break. 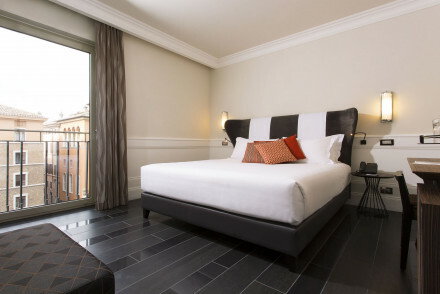 Elegant rooms and suites, wonderful roof terrace bar, and walking distance to the Pantheon. Roman classicism and a traditional atmosphere throughout, from the dining room, to bedrooms, to terraces and dining room. A relaxing choice for a family, group or couple. 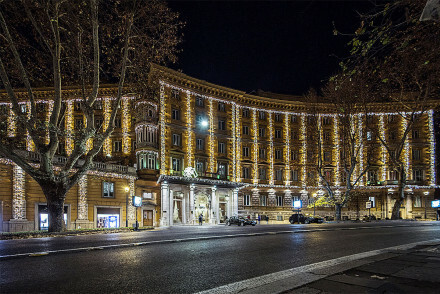 An exquisite hotel opposite the Colosseum. 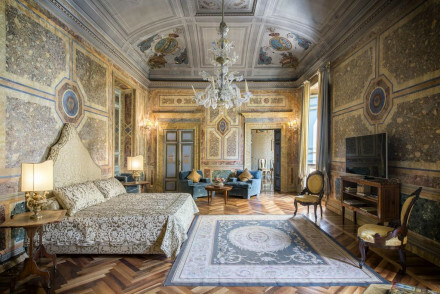 Individual rooms feature mosaic floors, frescoes, trompe-l'œil paintings and all the modcons. Roof terrace and children's pool, and an impressive breakfast room. An unbeatable location in the city. A luxurious and romantic choice for city exploring. 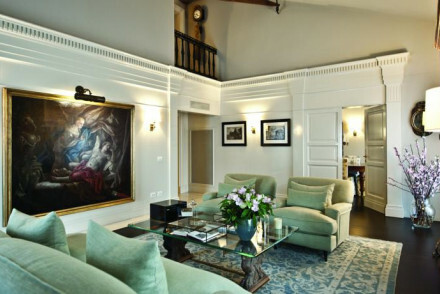 These boutique suites are situated in the heart of Rome. The individually styled rooms are named after famous Roman figures and feature international design pieces and luxury linens. The most spacious suites offer a free-standing bathtub and a modern fireplace. A sleek and modern city bolt-hole. A chic little B&B with just three rooms and a lovely breakfast courtyard. Rooms themed by colour have silk paintings, oak floors and antique furniture. Understated, welcoming, and not at all glitzy. A great choice for a weekend away in Rome. 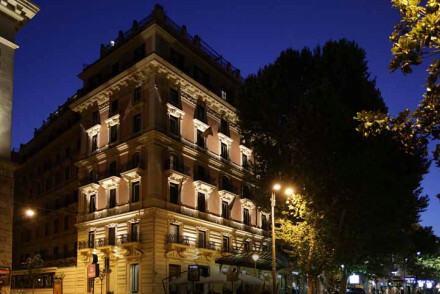 This heritage hotel occupies a former private residence in central Rome, close to Piazza Venezia. Rooms are dressed in a warm, neutral palette, allowing the building's classical features to do the talking; the best suites boast original frescoes and elegant Meridiani sofas. A stylish boutique hotel. A beautiful guesthouse near the Colosseum. Attractively decorated bedrooms, suites and family rooms in contemporary classic style, some with mahogany four poster beds, fireplaces, and private balconies. A lovely rooftop terrace is a bonus. Sights nearby - Located between the Roman forum and the Colosseum. Many other attractions in walking distance. Contemporary, sleek hotel in the shadow of the Colosseum in the centre of Rome. Gorgeous roof terrace over looking the city bell tower and Colosseum. Attentive staff. Bedrooms are retro and stylish. Excellent gym, cool Centrum bar and La Terrazza serves the best pasta. Near perfect urban hotel. 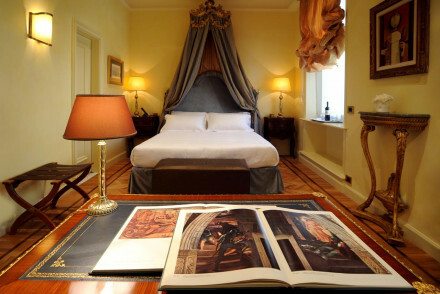 Six elegant suites located within a grand building in a quiet part of Rome. Stunning suites are contemporary in style and design yet reminiscent of Roman opulence. Indulgent bathrooms, the best featuring enormous bathtubs. Well positioned to reach this historic city's attractions. A luxurious base. Local exploring - A luxurious base, well placed within the city for getting around. Sights nearby - Just a 5 minute drive from the Coliseum and ealking distance from Terme di Caracalla. 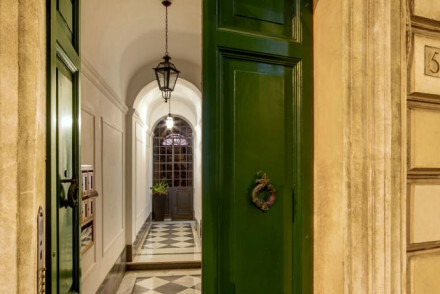 A 16th century townhouse, turned boutique B&B, in central Rome. Think country style interiors with a modern twist, with exposed wooden beams and designer furniture. The uniquely decorated rooms exude rustic charm and a warm welcoming ambience. Enjoy a hearty breakfast before checking out the sights. Value chic - This sleek and stylish B&B is great value, especially in the low season- centrally located and full of quirky charm. Local exploring - In a quiet and secluded street yet right in the middle of centro storico, the perfect spot for culture vultures! Great walks - Wander the narrow lanes and cobbled streets of Rome’s centro storico. Sights nearby - The nearby Spanish Steps cannot be missed. This four-star hotel is housed in a renovated 16th-century monastery in Rome's stylish Trastevere neighbourhood. The elegant suites feature antique furniture and plush linens; the best have a pretty balcony and luxurious bathtub. Don't miss the beautiful roof terrace. A breathtaking heritage hotel. A very polished hotel with an excellent spa and contemporary classic rooms. Bedrooms and suites have glossy parquet floors, big comfy beds, exposed beams, and enormous marble bathrooms. Fantastic spa equipped with sauna, hot tub and a menu of therapies. An excellent choice for a modern spa break. Sophisticated collection of designer suites in an aristocratic residence. Super modern furniture, white washed walls, and glass bathrooms contrast original oil paintings, parquet floors and wooden beams. Very private, very sleek, very cool. Sights nearby - Located just behind the Piazza Navona in the historic centre of town. Easy access on foot to most sights. A den of luxury to bring out the romantic in you, with an emphasis on sensuality. Outsized glass-sided showers and luxury bathtubs share the living space with giant round beds. Set in a handsome historic building metres away from the Spanish Steps, it’s an oasis for couples and honeymooners. Fantastic boutique chic guesthouse. Centrally placed with spectacular rooftop views over Rome. Romantic bedrooms have four poster beds, white washed walls, and flashes of modern art on the walls. Exclusive roof top views, hot tub, and minutes from galleries and designer shops. Very trendy. A chic, comfortable hotel in central Rome. 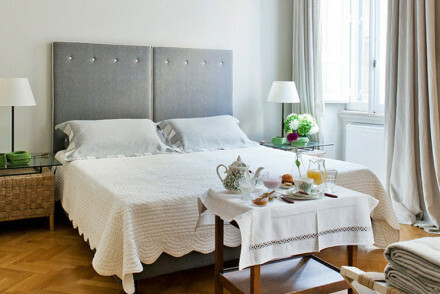 Clean, crisp rooms follow blue and yellow theme, with individual details such as floral arrangements and artworks. Close to the Piazza Navona, perfect for local exploring. Classic hotel with the air of a private home. Great walks - Wander the streets towards the Spanish Steps and explore the rabbit warren streets. Local markets - Explore the nearby Portico d’Ottavia, the Jewish quarter of Rome. This boutique hotel occupies the fourth floor of a historic palace in Rome's Monti district. Recently renovated rooms boast leather sofas and marble bathrooms; the best suites overlook the majestic Basilica of Santa Maria Maggiore. Enjoy a unique breakfast in the airy dining room. A charming hotel. Hotel Raphael is an eco-hotel with a rooftop restaurant serving award-winning biodynamic cuisine with views of the Basilica. Rooms and suites are luxurious and opulent, featuring red and gold decor, High Renaissance artwork, and marble-clad bathrooms. Bygone grandeur and environmental sensibility. 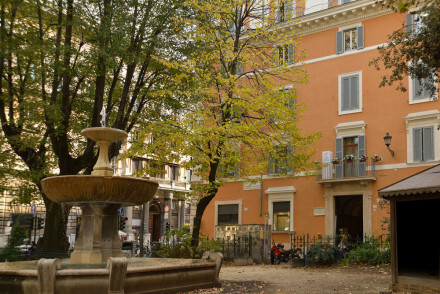 This hotel is located in central Rome, just ten minutes away from Villa Borghese park. It features contemporary and spacious air-conditioned rooms, some of which have wonderful views of the city. Be sure to unwind in the sauna or hot spring bath after a long day sightseeing. A classy, upmarket spot. 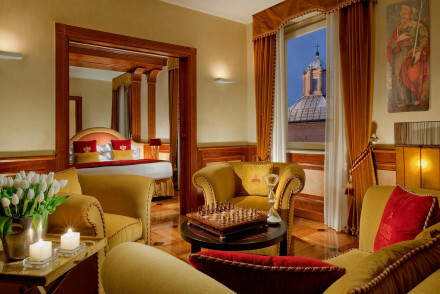 A haven of tranquility in the Eternal City, Palazzo Dama is a stellar hotel. Whether you are looking for luxurious rooms, great restaurant or a place to relax, it has all the bases covered. With central Rome on the doorstep, it's an ideal base for a romantic weekend away in Caput Mundi. Sights nearby - A stone's throw from both Piazza del Popolo and Piazzale Flaminio. Great walks - Strolling through Rome is one of the city's greatest activities. Local markets - Browse the many bustling markets of Rome. 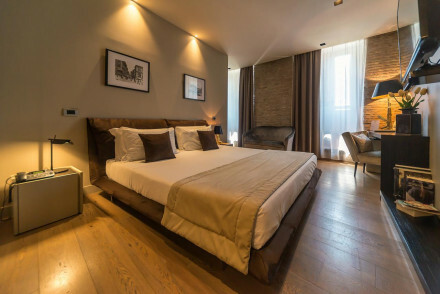 Sleek boutique suites surrounded by designer shopping and next to the Spanish Steps. More private apartment than hotel room. Plush interiors and modern gadgetry. Add to that a fabulous breakfast terrace on the roof and you have a very upmarket and private Roman spot. A 1920s Art Nouveau styled hotel oozing character and offering prime positioning. 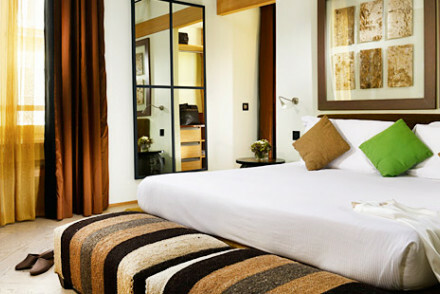 Spacious, beautifully designed rooms with mod-cons and excellent business facilities. The lively bar attracts a local and fun crowd. Perfect for a romantic weekend. Romantic Break - Chic decor, central location and romantic rooftop bar make this an ideal getaway for two! Local exploring - Use the free hotel bikes to explore the historic city centre like a local. Great walks - Just five minutes away you'll find Villa Borghese, the third largest public park in Rome. Sights nearby - Check out the iconic Piazza del Popolo, located just a few minutes from the hotel. This luxurious bolt-hole is nestled beside the verdant Villa Borghese gardens. Suites are bright and airy with views over the pool; expect period style, antique furniture and chandeliers (the best have a private jacuzzi). Dine in the Michelin-starred restaurant at this elegant hideaway hotel. 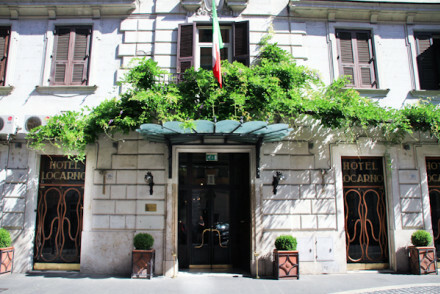 This four-star boutique hotel is located in the centre of Rome. Rooms are bright and spacious with modern interior design in sunny tones; the best suites offer a private terrace with views over the city. Book in at the sleek hotel spa or relax in the rooftop jacuzzi. A stylish, contemporary hotel. Foundations of a former convent complete with cloisters and modern day frescos. Large, simple rooms are great value plus a complimentary continental breakfast in the courtyard. 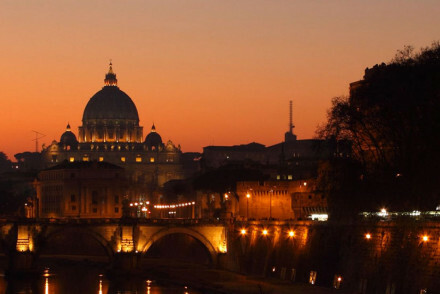 Perfect location for Rome’s nightlife and sight seeing. Value chic - An utterly superb spot, with quaint rooms facing the fragrant courtyard and an extensive wine list, all for a minimal cost. Sights nearby - A must see is the Piazza Santa Maria and its exquisitely mosaicked church, just around the corner from the hotel. Great walks - For a birds eye view of the eternal city wander up the dizzy heights of Gianicolo Hill. 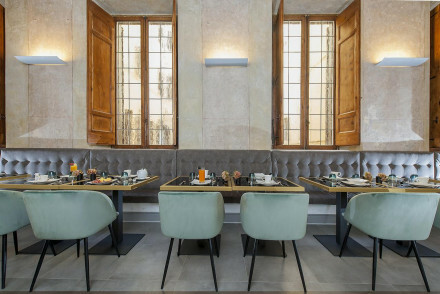 This contemporary design hotel is located in the stylish Monti neighbourhood in Rome. Rooms boast four-poster beds and original artworks, as well as smartphones with local SIM cards. Relax in the jacuzzi on the hotel's roof terrace before a treatment in the tranquil spa. An upmarket boutique hotel. This luxury hotel is housed in a 15th-century palazzo in central Rome. Rooms contrast modern, innovative design pieces with original wooden floors and vaults; the best suites offer a private terrace with a butler at your disposal. The impressive Ambassador Suite spans three floors. A chic city stay. A 16th-century palazzo comprising of just three fabulous suites. Each suite is more reminiscent of an apartment with ample space, ceiling frescoes, gilded chandeliers and four poster beds - the best even has its own library. Even better it's located slap bang in the heart of the city. Local exploring - A luxury abode in the heart of the city. Sights nearby - Visit some of the city's most famed sights such as the Ara Pacis, the Pantheon and the Trevi Fountain. 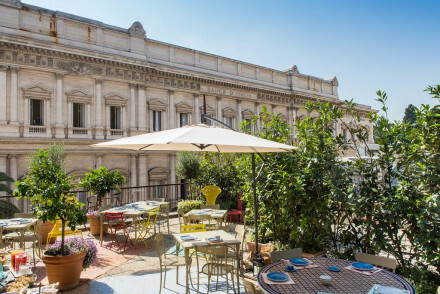 Just steps away from Piazza Navona and the Pantheon this sleek hotel, a 17th century town house in quiet cobbled street, is beautifully placed in the heart of Rome within walking distance of all the main sights. Cool contemporary suites, restaurant and pretty roof garden with city views. 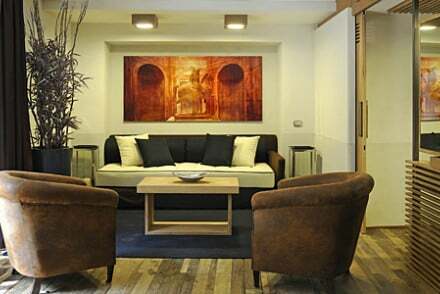 A very slick collection of suites in one of Rome's most central, peaceful and attractive mews. Large, minimalist, and shiny with all the modern gadgetry. These suites can cater to any type of traveller; groups of friends, families, or couples. Palazzo Navona is a four-star hotel boasting rooms with slick design, Scandinavian-inspired furnishings and whitewashed walls. The bar and panoramic rooftop create a lively atmosphere, but its main attraction is its enviable location right in the middle of Rome's historic centre. Families - Located on the back of Piazzo Navona, this comfortable hotel provides the perfect base for families seeking easy sightseeing! 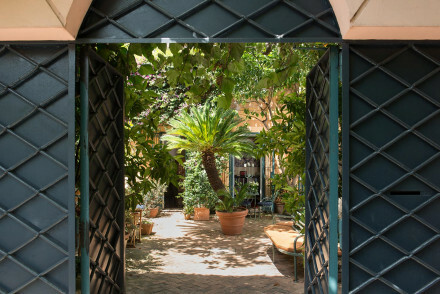 Located in the heart of Rome, this designer Mansion is uniquely decorated and boasts its very own contemporary art gallery. There are six individually decorated guest rooms and a Turkish steam bath for relaxing after a day's sightseeing. The perfect blend of contemporary and classic Roman elegance. Art deco extravaganza on the Via Veneto, part of Baglioni Hotels. The original Roman Grand Dame, the Regina offers opulent interiors, restaurant, spa and gym. Great location means easy access the delights of Rome. Private Hot Tub - Book the Margherita Suite for your private terrace with hot tub. This plush hotel sits within a 17th-century palace designed by Italian architect Francesco Borromini overlooking Piazza Navona. 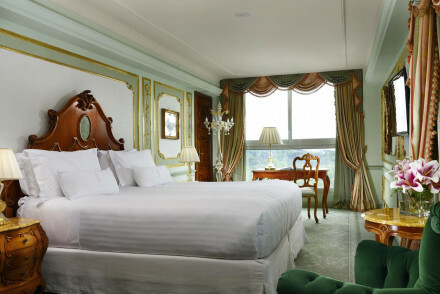 Suites have a classical feel, featuring antique furnishings and luxurious linens; the best offer spectacular city views. Don't miss the rooftop terrace bar. A unique hotel. Gloriously sleek and private self-catering rooms and suites, excellently located near the Spanish steps, equipped with every modern gadget. Bedrooms and suites have their own living areas. Ideal for couples, families, or groups. Stunning designer hotel in the historic centre of Rome, with rooms awash in palatial elegance and artworks from the Russo Art Gallery. There is a bar with an impressive selection of wines and a bistro serving locally sourced cuisine. 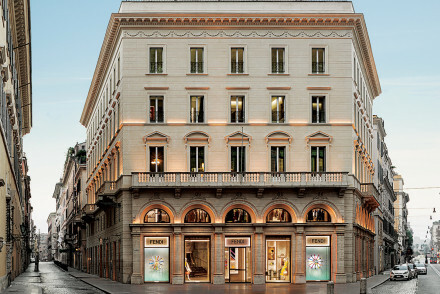 Ideal for luxury shopping or exploring Rome's ancient heritage. 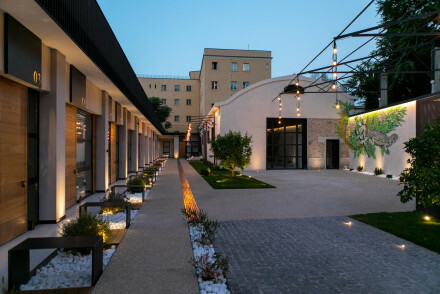 Local exploring - This hotel has a prime location for exploring the sites of Rome: on the doorstep of the Ara Pacis and the Coliseum. Great walks - The Coliseum is 1.4 miles away and to walk there you pass through many sites, from fascist monuments to ancient structures. Sights nearby - The Ara Pacis, one of Augustan Rome's most beautiful architectural marvels, is only 0.1 miles away. 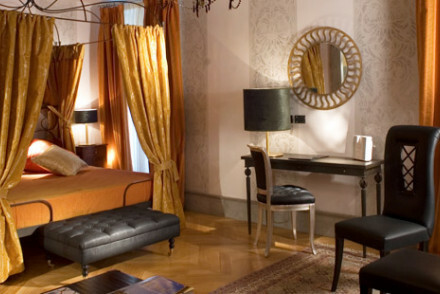 This intimate, five-star hotel occupies a former 17th-century palace on the elegant Via Giulia, Rome. Rooms are contemporary with hand-selected artisanal and design pieces; a warm palette adds a homely feel to the suites. Sample modern takes on Italian classics at the restaurant. An inviting hotel. An intimate hotel offering just fourteen luxury rooms with high ceilings, statement black four-posters, contemporary art and modern bathrooms. The jewel in this hotel's crown is its Michelin-star restaurant famed for reinventing Italian classics. 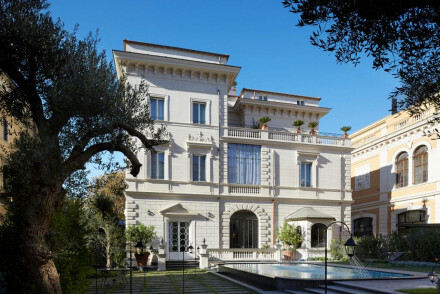 Located in Rome's affluent Borghese district. Superb! Traditional and formal old-time favourite of Hollywood elite. Elegant rooms and suites with silk curtains and antique furnishings. Cafe Romano serves lovely Mediterranean fare and the Bond Bar is a must for a martini! Perfect location below the Spanish Steps, in the middle of the Fashion District. Great walks - Located in one of the most historic areas of Rome, spend a day wandering the streets and taking in the sites. Sights nearby - Just a few 100 meters from the famed Spanish Steps. A beautifully restored 19th century palazzo located in the heart of the city. The four spacious suites feature high ceilings, long sash windows, Renaissance-style frescoes and Venetian mosaic tile floors. A luxurious base to explore the city from. Local exploring - Ideally located in the heart of the city with many of its main attractions within walking distance. 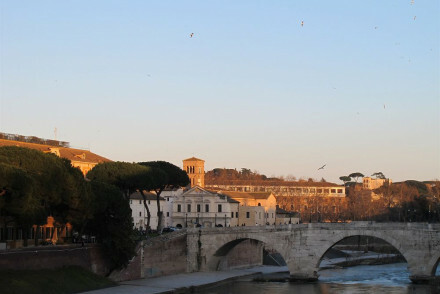 Sights nearby - Stroll from the hotel to the Spanish Steps, Ara Pacis and Piazza del Popolo. This luxury, five-star hotel is a stone's throw from Piazza Barberini. Dating from 1889, the hotel offers plush suites with Wengé wood floors and classical interior design; the best rooms boast a private terrace and whirlpool. Relax in the spa or cocktail bar at this exclusive guesthouse. 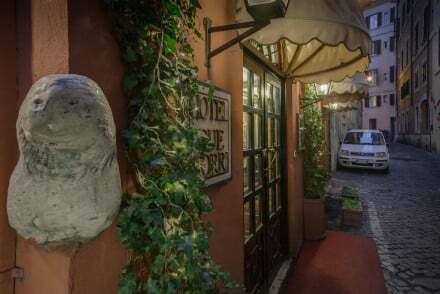 This exclusive concept hotel is located in the heart of Trastevere, Rome. Rooms feature original works by artist Lucamaleonte, crisp linens and wood accents; book a deluxe room to enjoy a marble Italian bathtub. Relax with a drink on the terrace or at the roof garden. A smart, contemporary hotel. 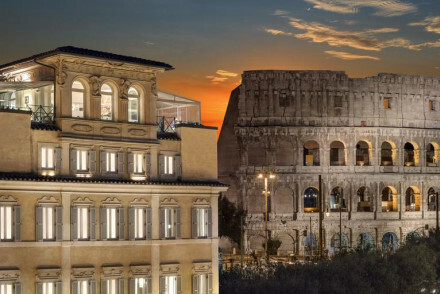 Five Star luxury next to the Colosseum and the Forum with exceptional views of both from an excellent roof top restaurant. Chic rooms, suites, and apartments in contemporary classic design. Fantastic food, unique views, and wellness too. Rome in style. This intimate boutique hotel is located in the historic centre of Rome. 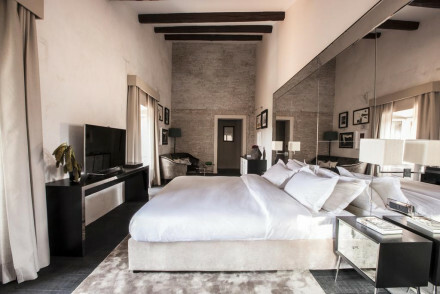 Rooms are dressed in a simple, elegant style and boast exposed wooden beams; expect Italian design pieces, Hermès toiletries and plush Rivolta Carmignani bedding. Book a superior room to enjoy a pretty balcony. A stylish stay. This exclusive hotel and spa is situated in Rome's luxury Parioli district. Rooms are classically dressed, with rich linens and plush carpets; the best have a private terrace with panoramic views of the most famous sights. Choose between three restaurants or dine by the pool. An indulgent city stay. 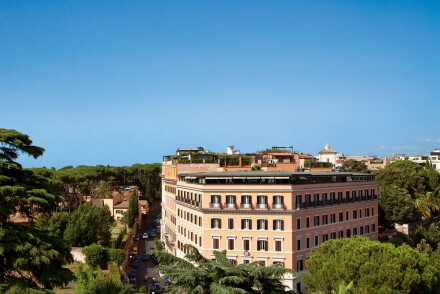 Beautiful contemporary Roman hotel overlooking the Piazza del Popolo. Plush rooms are light and airy, many of them feature courtyard garden views. Luxury with style, great food and a spa and pool. A grown up city escape. Garden - Stunning terraced gardens where you can dine during the summer months. Spa - Featuring hydropool and Turkish steam bath. Sights nearby - 10 minutes walk from The Spanish Steps. A boutique property boasting a very central location in Rome. Elegant rooms perfectly mix traditional and contemporary styles with simple furniture, crisp white linen, soft hues and modern art. A lively bar serves up innovative cocktails and the restaurant offers a modern take on Italian classics. 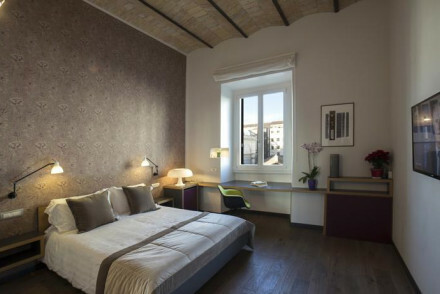 City Style - An elegant boutique hotel located in what was once Rome's school of architecture. Sights nearby - The Spanish Steps, Trevi Fountain and Medici Villa are all within a 10-minute walk. Great walks - Take a walk through the scenic Borghese Gardens. 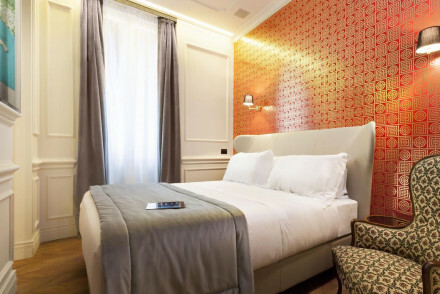 Part of the prestigious Pantheon Collection, this new boutique hotel is located in the heart of Rome's old town. Individually styled rooms boast wooden flooring and Art Deco wallpaper; the best suites are split-level and offer a private Turkish bath. Enjoy an aperitif at the cosy bar; a sleek hotel. Peaceful, romantic refuge in the smart hilltop Aventine district. Baroque flamboyance meets contemporary details to create a hotel with huge personality. Overlooking the Sant’Anselmo Church and within range of all main attractions, while staying off the beaten track. Great walks - Take a stroll in The Circus Maximus, an ancient Roman chariot racing stadium and mass entertainment venue. 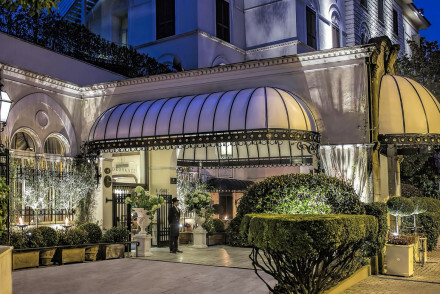 A five-star luxury hotel in one of Rome's most exclusive areas. Traditionally furnished rooms exude opulence and old world style with bold fabrics, antiqued furnishings and spectacular views of the city. Unwind in the Piano bar or soak up the skyline in the fine dining rooftop restaurant. Spoiling. Romantic Break - The opulent and enourmous suites are ideal for a couples hideaway, not to mention the romantic rooftop resturant. Local exploring - Perfectly located for exploing the sights of Rome, close enough to travel by foot or bicycle. Great walks - Visit nearby Borghese Gardens for lovely walking gardens, museums and historic buildings. Sights nearby - Close to the Spanish Steps, one of Rome's most famous sights. 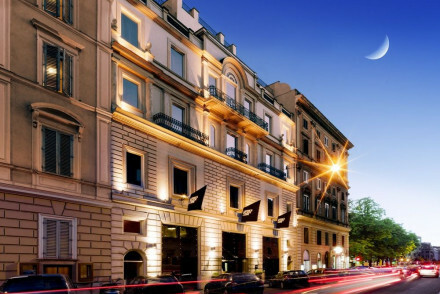 This luxury hotel is located off the exclusive Piazza De' Ricci in Rome. Suites are dressed in a vintage style, with frescoes and hand-selected antiques; the best offer a private balcony. Let the hotel's professional sommeliers guide you through a private wine tasting before dinner. A chic stay. 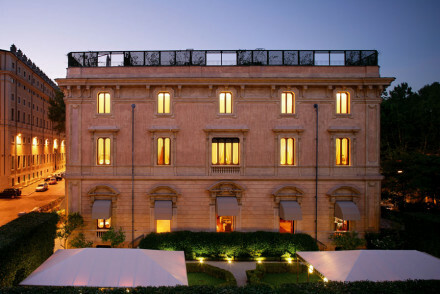 This luxury hotel occupies a palazzo in Rome's most aristocratic district. Rooms are regally dressed; rich linens and antiques complement the building's original stuccoes. The best suites have a terrace with city views. Enjoy fine dining at the gourmet restaurant. An exclusive Italian guesthouse. 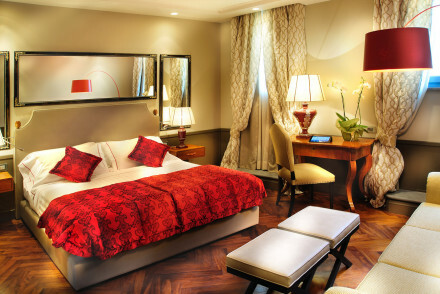 This elegant, four-star hotel is situated in a heritage building in central Rome. Rooms are modern with wooden floors and stylish design pieces; family rooms are great for travelling with children. Enjoy panoramic views from the hotel's roof terrace before dining at the restaurant. A refined hotel. One of the hippest spots in town, at G-Rough you'll find a unique blend of luxury living and trendy design finishes giving this 17th century townhouse a very urban vibe. Parquet floors & original tiles come with an eclectic mix of retro style furniture. Roof terrace for chilling and buzzy bar. City Style - Achingly trendy interiors - certainly not one for traditionalists! 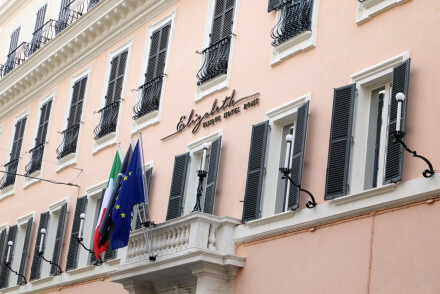 This exclusive hotel occupies an 18th-century building on Via del Corso. 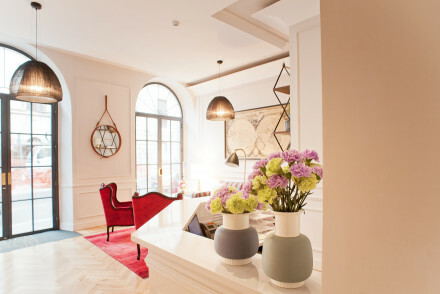 Rooms are dressed in an aristocratic style and blend hand-selected design pieces with unique artworks; the best suites have a pretty terrace with French doors. Discover the hotel gallery's private collection. A stylish break. 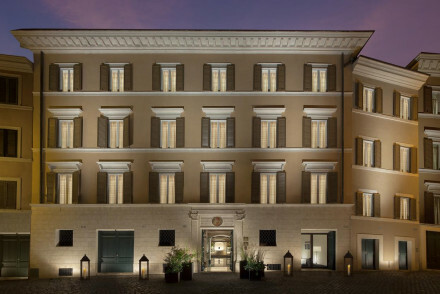 This luxury five-star hotel occupies a renovated palazzo on the scenic Via Margutta in Rome. Plush suites are dressed in a golden palette with dark wood accents; the best offer a huge private patio. Eat at the chic Assaggia restaurant, headed by a Michelin-starred chef. A stylish city base. A quintessentially noble Roman townhouse renovated to perfection. Tranquil, classic, and aristocratic rooms, suites, and living areas in a peaceful neighbourhood. Marble fireplaces, oil paintings, Doric columns, tapestries throughout. Excellent food, libraries, gardens, and spa. Very special. 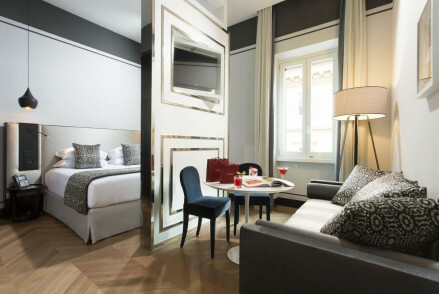 Luxury boutique suites in Rome's fashion district. Like the shops below, these suites are just as fashionable and come with an equally expensive price tag, with good reason. 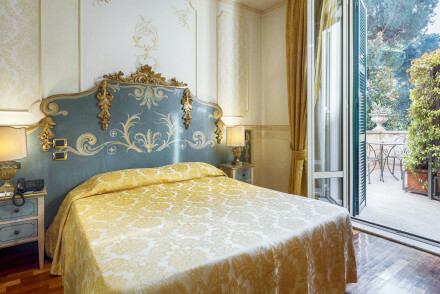 Each suite boasts enormous space, haute couture designer furniture, marble bathrooms, kitchenettes and private terraces. 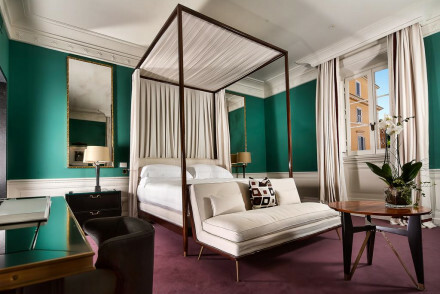 This luxury hotel occupies a heritage building annexed to Palazzo Borghese in Rome. 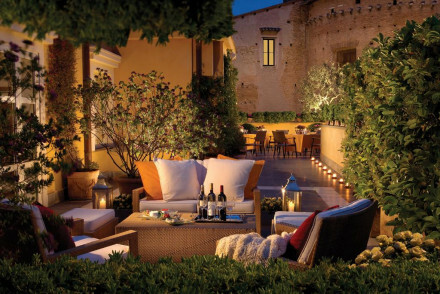 The 16th-century building has been renovated to offer bright, modern rooms with unique design pieces; the best suites have a terrace with views of the palazzo gardens. Eat at the gourmet restaurant; a stylish stay. 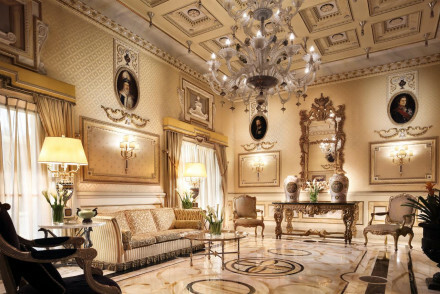 Incredibly opulent apartment suites drenched in old world Italian romance. Huge oil paintings, taffeta silks, lavish beds, Baroque furniture, antique lighting and romantic pastels covering the walls. Each suite has a kitchenette, private terrace, in-house cook and access to a concierge service. This five-star hotel is located in the heart of Rome's city centre. The spacious and elegant suites are dressed in either a modern or neoclassical style; the best have plush living space and a terrace with views over the city. Dine at Imàgo, the hotel's Michelin-starred restaurant; luxury defined. 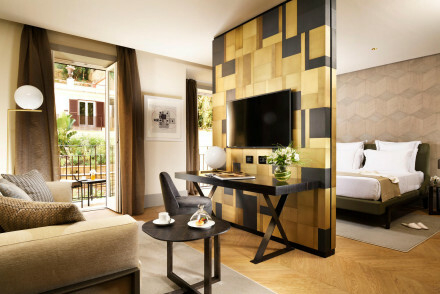 Fendi Private Suites offers contemporary and luxurious accommodation in Rome's Spagna district. Their Zuma restaurant serves up delicious Japanese-fusion cuisine. Make the most out of your location to see all that Rome has to offer. A classy and upmarket stay! Local exploring - With so many iconic attractions just around the corner there's no excuse not to go sightseeing! Romantic Break - Luxurious and private accommodation with a superb location-perfect for a romantic getaway! La Scelta di Goethe is a superlative small hotel, offering two superb luxury suites. The suites feature plush rooms and splendid living spaces with views out over the Vatican and Trinità dei Monti. A 24 hour butler will cater to guests every need. Indulgence at every turn. Honeymoons - With decadent suites, rooftop hot tubs, private butlers and spectacular views it's the ultimate indulgent honeymoon spot. Groups - Rent the whole of Goethe’s former abode with enough space to host a luxurious dinner party. Great walks - Walk up to the fantastic viewing point on top of the Palatine Hill. Sights nearby - Within ten minutes walk of both the Spanish Steps and the Pantheon.